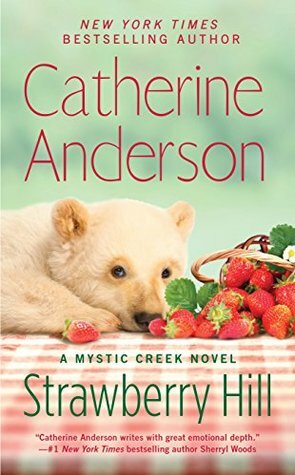 Strawberry Hill by Catherine Anderson– As a camp cook, Vickie Brown loves feeding any size crowd in the great outdoors–with one notable exception. She never would have predicted she’d join the crew led by gruff cowboy Slade Wilder, the man who broke her heart just days before their wedding. My Thoughts: I’ve been a fan of Catherine Anderson for a long time and I’ve read every book she’s ever written. It pains me to say that I did not care for this one. This is book number 5 in her Mystic Creek series, which I have loved up until this point. In fact, several of the books in this series have been favorites of mine. Unfortunately, there are 2 book descriptions out there and I was expecting this book to be about Wyatt, a deaf ranch foreman, and Erin, the new deputy in town. Instead the book is the second chance love story between Vickie and Slade who were torn apart 40 years prior. I think if I had known who the book was about I wouldn’t have been so disappointed by the lack of development with Wyatt and Erin. I was really feeling their interaction in the beginning of the book so I was sad that it didn’t go anywhere. I found Wyatt to be a very interesting character and wanted more of him. I think one of my major problems with this book, other than the error in the first blurb, was that the drama was completely caused by a lack of communication. I felt that Vickie’s actions, both past and present, were juvenile and immature. I did not find her to be a likable character at all and therefore I wasn’t invested in her finding a happily ever after ending. She was portrayed as the wronged character but I felt that Slade was the one who was wronged. It was nice to read a book about a couple in their 60’s but Vickie’s juvenile behavior made her seem so much younger. Honestly the star of the book for me was 4 Toes, a bear cub! I’ll definitely keep reading the Mystic Creek series but I probably will continue to borrow these from the library instead of purchasing them.